Portable and relatively inexpensive, binoculars offer great views of the Moon, comets, Milky Way star fields, and large deep-sky objects. Binoculars serve as one of the most useful and versatile astronomical tools. Ask someone what equipment they need to start exploring the night sky and, 99 times out of 100, they'll fire back "telescope" as the answer. Although a telescope may seem the logical choice, there's an alternative that in many respects works better. Binoculars are highly versatile instruments that can reveal craters on the Moon, moons orbiting Jupiter, Milky Way starfields, and even other galaxies. In many ways, binoculars prove superior to a telescope for those starting out in astronomy. They have a wide field of view and provide right-side-up images, making objects easy to find. They require no effort or expertise to set up — just sling them around your neck, step outside, and you're ready to go. That portability also makes binoculars ideal for those clear nights in the middle of the week when you don't have the time — or inclination — to get out a telescope. And for most people, observing with two eyes open rather than one seems more natural and comfortable. If that still hasn't convinced you, maybe price will. Unless you have money to burn on image-stabilized models, binoculars offer a more affordable way to tour the heavens than a telescope. If you're a parent hoping to foster a child's interest in the universe, binoculars are the ticket. Even if the appeal of stargazing eventually wanes, binoculars can be used for more down-to-Earth pursuits. Astronomy.com's equipment review database includes every review, roundup, and buyers guide that has appeared in Astronomy magazine in the last few years — more than 200 products overall and growing! Click the image start your search. 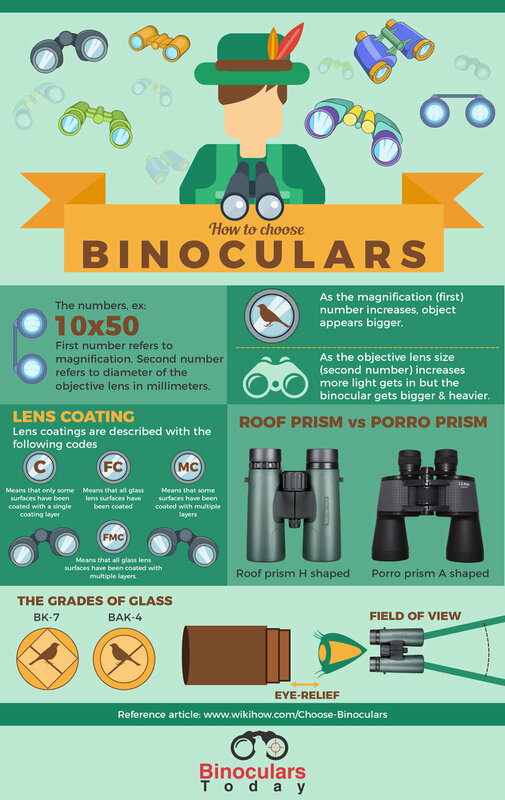 Before you purchase binoculars, you'll need to understand a few basics. Aperture is the most important binocular specification, at least in those intended for stargazing. Aperture describes the diameter of the front lenses. The larger the diameter, the brighter the resulting images. Astronomical binoculars should have a diameter of at least 40 millimeters (mm). Those with apertures of 35mm or less may be great for daytime viewing, but they won't gather enough light to give good views of most objects in the night sky. You can find the aperture simply by looking at the two numbers displayed on every binocular: 7x35 or 10x50, for example. The second of those numbers refers to the diameter (in millimeters) of each of the front lenses, so 7x35s have a diameter of 35mm and 10x50s have a 50mm diameter. Binoculars with an aperture of 50mm gather twice as much light through each lens as 35mm binoculars. The first of those numbers refers to the binoculars' magnification. For astronomical purposes, go for binoculars that magnify at least 7 times. The highest you'll want for hand-held binoculars is about 10x. If the magnification exceeds 10x, you likely won't be able to hold the binoculars steady enough to get a sharp image. Giant binoculars, those with magnifications above 10x and apertures greater than 50mm, require a tripod to deliver good views. Another key specification is the exit pupil. This describes the width of the beam of light as it leaves the eyepiece. You can calculate the exit pupil by dividing the aperture by the magnification. So, for example, all 10x50 binoculars have an exit pupil of 5mm and 7x50s have exit pupils of about 7mm. As the human eye adapts to darkness, the pupils dilate to let in more light. Unfortunately, as we age, our eyes' ability to adapt to changing light levels decreases. Observers who want the brightest possible images — and who doesn't? — should try to match the exit pupil to the pupil size of their dark-adapted eye. Most people younger than 30 who observe under a dark, rural sky will have pupils that dilate to about 7mm. They can take full advantage of binoculars that produce an exit pupil of 7mm. The maximum pupil size for those in their 30s drops to around 6mm, and if you're 40 or older, the pupil probably won't dilate beyond 5mm. If you use binoculars with an exit pupil wider than your pupil size, some of the incoming light won't get into your eyes and images will appear dimmer. Another specification to consider is field of view. Usually stamped somewhere on the binoculars, field of view typically is expressed either in degrees or as a certain number of feet at 1,000 yards (for example, 325 feet at 1,000 yards). To convert feet at 1,000 yards into degrees, divide the number of feet by 52.5 (e.g. 325/52.5 = 6.2°). Most binoculars have a field of view around 6° or 7°. Some high-power models will shrink this to 3° to 5°, while wide-angle models will take in 8° to 10°. Light bounces differently through binoculars according to the juxtaposition of the prisms. Porro-prism binoculars are generally preferred for astronomical use because they provide total internal reflection. Binoculars contain a complex set of prisms that fold the light path internally and make the image appear right-side up. These prisms come in two varieties: roof and porro. Roof-prism models have straight barrels and are more compact. However, they tend to be more expensive and produce slightly dimmer images, making them less desirable for astronomical pursuits. Porro-prism binoculars have a zigzag shape and usually are heavier and bulkier than roof-prism models. Most higher quality binoculars are made of barium crown glass (BaK-4) instead of borosilicate glass (BK-7). Also, look for coated optics — the more lens and prism surfaces to which special coatings have been applied, the brighter and higher contrast the images will be. Most binoculars have a central focusing knob that moves both eyepieces at once as well as one eyepiece that can be focused individually. To work the binoculars, first use the central knob to focus the eyepiece that can't be individually adjusted, then focus the other eyepiece. This type proves to be more convenient, particularly if you pass the binoculars from person to person. On other binoculars, both eyepieces can be focused individually. These tend to be more rugged and better sealed against moisture. Binoculars make a great investment for anyone interested in the night sky. Because binoculars gather more light than the naked eye, they help you find fainter objects. And because they magnify the view, they let you see more detail. Binoculars will show the Moon in crisp detail. Watch as shadows creep across lunar features as the Moon waxes and wanes throughout the month. Follow the stages of a lunar eclipse as Earth's shadow covers the Moon. And view delicate earthshine glowing on the dark side of a crescent Moon. Farther afield, binoculars let you follow the phases of Venus and track the orbital motions of Jupiter's big moons. In addition, binoculars will help you pick out Mercury low in the twilight sky and to spot objects too faint to see easily, such as the outer gas-giant planets, Uranus and Neptune, as well as the brighter asteroids. The advantages of binoculars perhaps show up best on a bright comet. Binoculars magnify enough to show exquisite detail while providing a wide-enough field of view that you can see the comet's head and most or all of the tail at once. For targets outside the solar system, binoculars work best on large deep-sky objects. They really shine on big star clusters like the Pleiades in Taurus or the Beehive in Cancer, which cover too much sky to see all at once through typical telescopes. Binoculars provide stunning views of Milky Way starfields and some of the larger emission nebulae that dot our galaxy's spiral arms. You even can spy some bright external galaxies: the Andromeda Galaxy (M31) and the Pinwheel Galaxy (M33) in Triangulum stand out. All told, more than 400 deep-sky objects lie within reach of good binoculars from a dark-sky site. StarDome — Astronomy.com's interactive star chart lets you construct an accurate map of your sky and find your favorite constellations, planets, galaxies, and more.